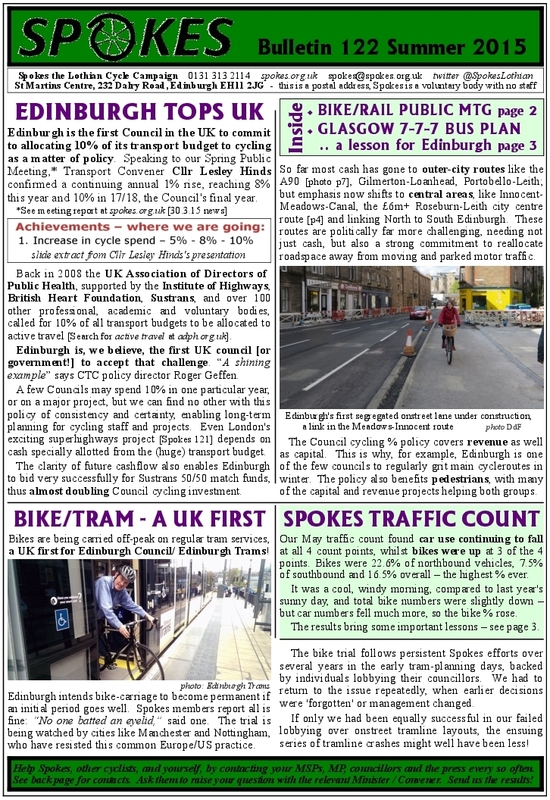 Spokes Bulletin 122 is hitting the doorsteps of all Spokes members, 1200 decision-makers across Scotland [including all 129 Scottish MSPs and all 132 Edinburgh+Lothians councillors, transport consultants, health officials, …] with copies for a further 10,000 other cyclists and interested individuals through bike shops, libraries etc throughout Edinburgh, Lothians and beyond. [p6] ‘War on the motorist’ ?? Everyone joining Spokes in the next few weeks will be sent these inserts along with the new Bulletin [until they run out]. 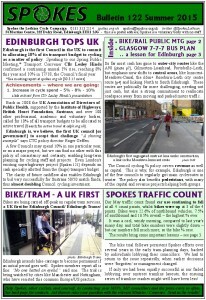 We have spares of the new Bulletin for bike leafletting at workplaces, shops etc – let us know if you could use a supply. Many Spokes members take a regular supply of each issue for their local workplace, shops or other useful desinations.